Stem cells residing in hair follicles are held in an inactive state for long periods of time. A new study shows that these quiescent periods are essential for maintaining the cells’ rejuvenating activity over time, and clarifies the mechanisms that bring the cells in and out of quiescence. Hair follicle stem cells lacking the protein FOXC1 can only retain one old bulge in their hair follicles, while normal stem cells can keep up to four. Adult stem cells provide the body with a reservoir from which damaged or used up tissues can be replenished. In organs like the intestines and skin, which need constant rejuvenating, these stem cells are dividing frequently. But in other body structures, including the hair follicles, they are held in a quiescent state–one in which they don’t reproduce until they receive signals from their surroundings that it’s time to regenerate. It makes intuitive sense that stem cells, being such a valuable resource, would be used sparingly. Yet scientists have limited understanding of how their quiescence is regulated, and are even unsure of its precise biological function. In a study published recently in PNAS, Elaine Fuchs, Rebecca C. Lancefield Professor and head of the Robin Chemers Neustein Laboratory of Mammalian Cell Biology and Development, and Kenneth Lay, a graduate student in her lab, report on new insights into the biological signals that make hair follicle stem cells oscillate between states of quiescence and regenerative activity. Usually the stem cells then create a new bulge along with the new hair, while ensuring that the old bulge and the old hair stay put in the hair follicle. Only the new bulge can make another new hair, but the old bulge is kept in place to maintain a thick and lush coat. In mice, hair follicles can accumulate up to four of these bulges. 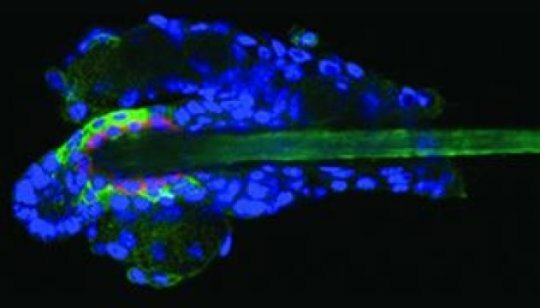 When Lay and Fuchs created mice that lack FOXC1–by disabling or “knocking out” the gene that produces this protein–they observed that the animals’ hair follicle stem cells spent more time growing hairs and less time in quiescence. Over the course of nine months, while hair follicles from normal mice grew four new hairs, those from the FOXC1 knockout mice had already made new hairs seven times. “The knockout stem cells enter an overactive state in which they can’t establish quiescence adequately,” explains Lay. The researchers also found that in the absence of FOXC1, hair follicles always had only one hair despite having made new hairs seven times. This is because these hair follicles could not retain their old bulges, though they generated a new bulge without a problem. As the stem cells started proliferating more, they became less able to stick together. As a result, their old bulges did not stay properly tethered to the hair follicle when the newly growing hair pushed past it. And since the bulge emits quiescence signals, its loss activated the remaining stem cells even faster. While the hair follicle stem cells of FOXC1-deficient mice produce hairs at a relatively breakneck pace, this profligate growth seems to wear them out. Older knockout mice had sparser, greyer coats, and they could not regenerate their fur as quickly as their normal age-matched or younger peers. A similar phenomenon has been described in mouse hematopoietic stem cells, which give rise to blood cells–those stem cells that are more active in young animals appear to become exhausted as the animals grow older. “Hair follicle stem cells influence the behavior of melanocyte stem cells, which co-inhabit the bulge niche,” explains Fuchs. “Thus, when the numbers of hair follicle stem cells declined with age, so too did the numbers of melanocyte stem cells, resulting in premature greying of whatever hairs were left.” Not much is known about naturally occurring hair loss with age, but these balding knockout mice may provide a model to study it.